I haven't back from you, so I'm going to telephone you this morning. Is (603) 232-9090 your work phone number? I don't want to touch on the namespace issue -- I'm leaving that in Don Day's hands -- but I do want to ensure that I clearly understand all of the other points so that we can avoid the sort of churn that we've been experiencing. Do you want each appendix topic -- for example, B.1, B.1.1, and B.1.2 -- starting on a separate page with a Level 1 header? Or should only Appendix A and Appendix B be treated that way? Please see my comments or questions below in <kje> tags. <kje>Help me understand, since I obviously misunderstood your earlier comments. Is it the case that the links in the "This version" section always point to a specific version -- cd01, cd02, cs -- but the links in the "Latest version" section always are the generic URIs? If so, is the following what you want in the "This version" section?" 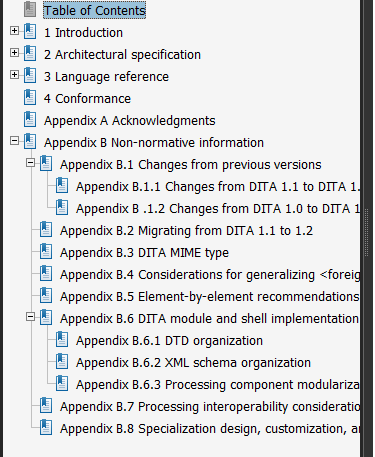 The nomenclature is problematic, since the actual "Declared XML namespace" is xmlns:ditaarch="http://dita.oasis-open.org/architecture/2005/"
Please let me know ASAP if you think such a reorganization will require a new TC vote.